A battery is a portable energy source that consists of one or more cells that transforms chemical energy into electricity. A standard car battery is made up of six cells ran in series, each one of these cells has 2.1 volts meaning a standard car battery is fully charged at 12.6 volts not 12volts. A CORE is your old worn out battery also called an exchange. All companies sell their batteries at a price that includes the exchange of an old battery. Why do we want your old battery? 1) So we can see what size battery originally came out of the application in order to match up the part number and the cranking amps. 2) To recycle it for its lead and plastic (batteries are 100% recyclable). Old batteries get sent out to smelters who melt down batteries and turn them back into new batteries. Core Charge is when a company charges a deposit for not having your old battery at the point of purchase. At Discount Battery we charge a core charge like everyone else does, but just keep your receipt and you can bring it back anytime at any of our stores. Core charges are an incentive to motivate you to bring the old battery back. Core charges vary; the bigger the battery the higher the deposit. We wish we did not have to core charge anyone but our suppliers core charge us and it is really the only way to ensure these batteries can be recycled and do not end up in landfills. Cold Cranking Amps (CCA) is the most common way of measuring a batteries capacity to crank an engine. The Battery Council International (BCI) defines CCA as the discharge load, in amperage – a new fully charged battery at 0 degrees Fahrenheit can deliver for 30 seconds and maintain a voltage of 12.6 or higher. Cranking Amps (CA) and Marine Cranking Amps (MCA) are the same thing. They refer to the number of mps a battery can deliver at 32 degrees Fahrenheit for 30 seconds and maintain a minimum voltage of 1.2 volts per cell. An alternator is an electromechanical device that converts mechanical energy into electrical energy in the form of alternating current and back to DC through diodes. Alternators are used in automobiles to maintain the charge in the battery (discharged batteries need to be charged by an external charger) and to power a car’s electrical system when the engine is running. At Discount Battery we are always willing to test any alternator on any vehicle for free (must be hooked up to the vehicle). The alternator is made up of four main components: stator, rotor, diode and the voltage regulator. The serpentine belt spins the pulley on the alternator making the rotor spin inside the alternator. The rotor is a big magnet that spins inside a nest of copper wires called the stator. It is the spinning of the rotor inside the stator that produces electricity. The diodes change the electricity from AC to DC that your battery needs. The last part in the process is the voltage regulator which maintains a healthy level of voltage to the battery (usually 13.5 volts). Deep Cycle batteries are specially built to handle a lot of charging and discharging (try not to discharge below 50%; really shortens the life span). They are designed for applications such as marine trolling motors, backup power supplies, sub pumps and more. Deep cycle batteries are made with thicker plates to hold up with higher heat generated by a lot charging. They are built with plate separator ridges to reduce expansion due to higher heat and stop vibrations. The plates are suspended higher off the bottom of the battery case to stop premature failure by plate particulate breaking and shorting out the battery due to increased charging. Reserved capacity is the most important specification when it comes to purchasing a deep cycle battery. It tells us the capacity of a battery in terms of minutes a battery can maintain a useful voltage under a 23 amp draw (the higher the rating the longer the run time between charges). Deep Cycle is different than CCA. CCA is a measure of a quick burst of power unlike deep cycle which is designed for a long continuous draw of power. Refer to owner’s manual for manufacturer’s recommended procedure. Shield eyes and face at all times. Never lean directly over battery when testing, jump starting or performing other maintenance. Be sure vent caps are tight and level. Place a damp-rag over the vent caps of both batteries. Be sure vehicles do not touch each other. (1) Connect positive (+) booster cable to positive (+) terminal of discharged battery. (2) Connect other end of positive (+) cable to positive (+) terminal of assisting battery. (3) Connect negative (–) cable to negative (–) terminal of assisting battery. (4) MAKE FINAL CONNECTION OF NEGATIVE (–) CABLE TO ENGINE BLOCK OF STALLED VEHICLE, AWAY FROM BATTERY. See diagram below for proper hook-up. Batteries, battery posts, terminals and related accessories contain lead and lead compounds, and other chemicals known to the state of California to cause cancer, birth defects or other reproductive harm. WASH HANDS AFTER HANDLING! Warning: Follow all safety instructions when handling batteries! Always wear safety glasses and face shield when working on or near batteries. All batteries generate explosive hydrogen gas. Keep sparks, flames and cigarettes away from batteries at all times. Do not connect or disconnect “live” circuits. To avoid creating sparks, always turn charging and testing equipment off before attaching or removing clamps. Perform all work in a well ventilated area. Never lean directly over a battery while boosting, testing or charging it. PROTECT YOUR EYES! Cracked or broken case or cover. You must boost charge a weak battery before load testing. If fully charged, perform a load test. PROTECT YOUR EYES. Fill each cell to proper level with battery-grade sulfuric acid of 1.265 specific gravity. Battery and acid must be at a temperature of 60 – 100 degrees fahrenheit at time of filling. Boost charge 12V batteries at 15 amps until specific gravity is 1.250 or higher and the electrolyte temperature at least 60 degrees fahrenheit. BOTH CONDITIONS MUST BE MET. (Boost charge 6V and 12V heavy-duty batteries at 30 amps.) If violent gassing or spewing occurs, reduce charge rate. After charging, check electrolyte levels. If required, add additional electrolyte to bring all levels to the bottom of the vent wells. DO NOT OVERFILL. If the battery requires top-off while in service, add distilled water…DO NOT ADD ACID. Before removing old battery, mark the positive ( + ) and negative ( – ) cables for proper connection to the new battery. Always disconnect the ground cable first [usually negative ( – )] to avoid any sparking around battery. Then disconnect the positive ( + ) cable and carefully remove the old battery. Clean and inspect. If necessary, repaint or replace the tray, hold-down and/or battery cables. Cable ends must be clean and corrosion free. Cable must not be frayed or bare. Put corrosion protection washers on battery terminals. Install new battery in same position as old one and tighten hold-down. Be sure terminals will clear hood, fender, box lid, etc. to avoid vehicle damage and/or explosion. Connect positive ( + ) cable first. Connect ground cable last. If side terminal connection, use a special side terminal torque tool to tighten side terminal cables to avoid damage. Never over tighten or hammer cables onto terminals. Coat terminals and cable connection with a corrosion protection spray. The voltage regulator should be checked every 10,000 miles or every time you change oil. It should be checked immediately if the battery is hot to the touch, if electrolyte is bubbling or spewing from the vents, if your hydrometer reading is below 1.225 or above 1.300, or if the open circuit voltage is below 12.4 volts or above 12.9 volts. Over-charging is evident by excessive water consumption and/or spewing or bubbling of electrolyte out of the vents. Undercharging is evident by slow cranking or lights dimming at idle. To avoid a battery explosion, never attempt to charge a frozen battery. Allow it to warm up to room temperature before placing on charge. Warning: Gel and AGM (Absorbed Glass Mat) batteries require a voltage-limited charger. Charging a Gel or AGM battery on a typical shop charger – even one time – may greatly shorten its life. Important: Never overcharge batteries. Excessive charging will shorten battery life. Prior to charging, read the manufacturer’s instructions for proper charger hook-up and use. Warning: If the electrolyte is accessible, verify that plates are covered before beginning to charge. At the end of charge, add distilled water as needed to bring levels to the proper height. If water is added, charge for an additional 30 minutes to mix. If electrolyte levels are low, but battery is not accessible, remove battery from service. The maximum charge rate in amperes should be no more than 1/3 of the battery’s reserve capacity minute rating. If the terminal voltage exceeds 16.0 volts while charging, reduce the charge rate. Continue charging and reduce the rate as needed until a two-hour period results in no increase in voltage or decrease in current. If violent gassing or spewing of electrolyte occurs, or the battery case feels hot to the touch, temporarily reduce or halt charging. Side Terminal Charging Posts: Should be used to ensure the best testing and charging results for side terminal batteries. The charging posts will provide a flush lead-to-lead contact. Be sure to tighten the charging post until it is snug and secure. This will allow a strong current to pass from the charging post to the battery terminal. DO NOT USE Battery Bolt Extenders or Battery Bolts for testing or charging batteries. They do not provide the necessary lead-to-lead contact, and can reduce your cold cranking amperage (CCA) and state of charge readings. Batteries should be boost charged if the open circuit voltage (voltmeter) reading is below 12.4 volts. See charging chart. NEVER CHARGE IN YOUR HOUSE! The process is the same for all types of lead-acid batteries: flooded, gel and AGM. The actions that take place during discharge are the reverse of those that occur during charge. The discharged material on both plates is lead sulfate (PbSO4). When a charging voltage is applied, charge flow occurs. Electrons move in the metal parts; ions and water molecules move in the electrolyte. Chemical reactions occur at both the positive and negative plates converting the discharged material into charged material. The material on the positive plates is converted to lead dioxide (Pb02); the material on the negative plates is converted to lead (Pb). 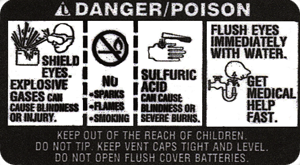 Sulfuric acid is produced at both plates and water is consumed at the positive plate. If the violate is too high, other reactions will also occur. Oxygen is ripped from water molecules at the positive plates and released as a gas. Hydrogen gas is released at the negative plates – unless, oxygen gas can reach the negative plates first and “recombine” into H20. In a fully charged battery, most of the sulfate is in the sulfuric acid. As the battery discharges, some of the sulfate begins to form on the plates as lead sulfate (PbSO4). As this happens, the acid becomes more dilute, and its specific gravity drops as water replaces more of the sulfuric acid. A fully discharged battery has more sulfate in the plates than in the electrolyte. IMPORTANT: Do not install any type of battery in a completely sealed box or enclosure. In the event of overcharging, the potentially explosive gasses MUST be allowed to escape. First perform an open circuit voltage test, then an adjustable load test. A load test is the best way to determine if the battery is delivering adequate electrical performance. Make sure your variable load tester is working properly. You can’t load test a discharged battery. If the voltage is below 12.4. be sure to completely charge it before continuing. Refer to the charging chart under “Charging Tips” section for important information. To avoid sparking and explosive gasses, be sure load tester is OFF and battery is disconnected before hook-up. Use computer memory saver to retain the vehicle’s electronic memory while the battery is disconnected. Connect the positive ( + ) tester clamp to the positive ( + ) battery terminal. Then connect the negative ( – ) battery terminal. Always protect your eyes. Estimate the internal temperature of the battery to the nearest 10 degree’s fahrenheit. Apply the load for 15 seconds. Note the voltage at 15 seconds with the load on and immediately shut the load off. A reading at least equal to the value from the chart below indicates a good battery. If the battery did not meet the required voltage and if it was not charged in Step 1, completely recharge the battery and repeat the test.If it still fails to meet requirements, replace the battery. Conductance uses the battery’s response to a very small signal in an attempt to predict the effects of a much larger current. Conductance testing is ineffective on a discharged battery. If the battery is known to be discharged or if the tester tells the operator to charge before testing again, the battery must be completely recharged. It may not be required to turn a conductance tester off or on. If off, you must turn on immediately when connected to a battery. Most will turn off automatically if ignored long enough. Some have no battery of their own and get all their power from the battery being tested. Connect the positive ( + ) tester clamp to the positive ( + ) battery terminal. Then connect the negative ( – ) tester clamp to the negative ( – ) battery terminal. If the battery has more than one pair of terminals ( e.g top posts and side terminals) always perform the testing on the terminals that are used in the vehicle. Use the proper charging adapters for stud or side terminal batteries. Never connect tester to a bolt or stud. Turn on if needed. Enter the requested information. Be sure to distinguish between a CCA rating and a CA or MCA rating. If no rating is available, use the minimum O.E battery CCA requirement of the vehicle. If the tester says to replace a battery that was tested in the vehicle, repeat the testing after removing the cables and cleaning the posts. 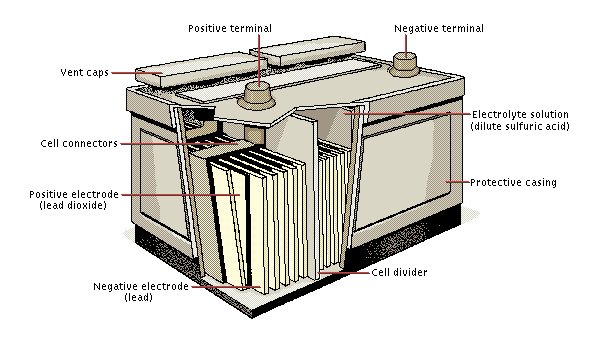 There are two styles of battery… non-accessible maintenance-free types and accessible maintainable types with removable vent caps. Before adding water to a maintainable battery, take an open circuit voltage reading and/or hydrometer reading of one cell. Use a different cell each time. If the readings are below 75%, charge the battery. If the electrolyte level is too low to read with a hydrometer, add water and take the hydrometer reading the following day, after the vehicle has been driven and the water has had an opportunity to mix. Check electrolyte levels in all cells. If necessary, add only clear, odorless drinking water to bring the liquid level to the level indicator or to 1/2″ (13mm) above the top of the separators. Distilled water is preferred, especially if the water in your area has high iron. DO NOT OVERFILL ANY CELLS. Excess electrolyte may be forced from an overfilled cell and cause corrosion on adjacent metal parts, reduce performance, and shorten life. In cold weather, do not fill cells with water and let stand without running engine or driving the vehicle long enough to allow water to mix with acid. Otherwise, freezing might occur and the battery may crack or explode. Maintenance-free, non-accessible batteries are designed to eliminate the need to add water. Yet the volume of electrolyte above plates may eventually become depleted due to abnormal conditions such as high heat or improper regulator setting. use a voltmeter to check the state of charge. See chart under “Charging Tips” to determine if charging is necessary. DO NOT OPEN FLUSH COVER BATTERIES! If opened, serious personal injury can result and warranty will be voided. A “series” system increases the voltage, but keeps the battery capacity ( cranking apms, amp hours, reserve minutes, and minutes running time) the same. Therefore, two 12-volt batteries connected in series (POS to NEG, NEG to POS) will deliver 24 volts at the same rating as one battery: During recharge, each battery receives the same amount of current; e.g. if the charger is putting out 10 amps, both batteries are getting 10 amps. During the recharge, the current (amps) is split between the batteries. The battery that is discharged the most will receive more current than the other until both are brought up to full charge. A “series / parallel” system provides a combination of voltage and capacity for special applications. The illustration shows an arrangement that would supply 24 volts to a starter and 12 volts to the electronics ( or vice versa). Rule #2 – Maintain the fluid levels whenever possible. Most batteries have cells that can be accessed; in these situations it is important to keep the fluid levels just above the lead plates. If the fluid levels get low add distilled water; wait 24 hours and then charge the battery on a slow charger overnight. It is important to note that some batteries are designed in such a way that you cannot add fluid (AGM, Gel, and maintenance free) these batteries are designed not to be accessible. Batteries should be stored in a cool, dry area in an upright position. Never stack batteries directly on top of each other unless they’re in cartons. Do not stack more than 3 high (2 high if battery type is heavy commercial). Test wet batteries every 4-6 nibtgs and recharge if necessary. Always test and charge if necessary before installation. ANTI SULFATE: Is a chemical that can drastically reduce sulfate crystal buildup on battery plate surfaces. This allows the battery to operate longer and give great battery life. All of our Premium, AGM, and Factory activated batteries have Anti-Sulfate added. Self discharge occurs when batteries slowly lose charge when not in service. With the use of special lead alloy grids, self discharge is minimal and the batteries maintain their state-of-charge. At lower temperatures, batteries can supply greater terminal voltage over a longer period of time than conventional batteries as shown below.